During Army Warfighting Assessment (AWA) 17.1, U.S. and coalition forces are conducting realistic war games in the austere southwest desert to improve how they fight, communicate and share digital data on the battlefield. More than 5,000 personnel are participating in this year’s AWA exercise, including U.S. Army elements from the 2nd Brigade Combat Team, 1st Armored Division (2/1 AD), who are fighting in realistic operational environments alongside U.S. Marine, Air Force, and Special Operations elements, as well as five Multinational partners from Australia, Canada, Denmark, Italy, and the United Kingdom (U.K.). «This exercise is an incubator of tactical interoperability», said the commanding brigadier of the U.K.’s 1 Armoured Infantry Brigade. (U.K. names omitted per unit request). «We want to efficiently share intelligence so we can see and visualize the battle space the same way and make quick decisions together». The U.K.’s 1 Armoured Infantry Brigade is an expeditionary readiness unit, similar to the U.S. Global Response Force in that it is a «first in» unit, so agility is paramount to the unit’s success. AWA 17.1 is providing a venue for the U.K. to improve operational tempo by assessing the human, procedural and technical aspects of three interoperability targets: a common operating picture; secure voice (interoperability on different radios), and digital fires, the brigadier said. «It’s the generation of tempo – observing, sighting and acting quickly», he said. «That is the prize: To fight tonight against a high-tempo, high-demand foe». The U.S. Army is conducting AWA 17.1 from October 17-28 at Fort Bliss and White Sands Missile Range, N.M. AWAs focus on the refinement and improvement of concepts and capabilities in live, virtual, and constructive domains, beyond the constraints of the formal testing environment of its sister exercise, the Network Integration Exercise, or NIE. «We will always be fighting with the Americans, the British, the French, so this exercise is very important to us», said the commanding officer for the 2nd Outland Dragoons Royal Danish Army. «It’s about interoperability regarding Command and Control (C2) communications and doctrine. It gives us understanding of what we are able to do and where the missing links are so we can fix it and go on». Among the tools in the coalitional interoperability tool box is an embedded software application known as the Multilateral Interoperability Programme, or MIP, which enables the U.S. and partner forces to share a comprehensive common operating picture. The UK is using MIP during AWA 17.1 to mediate between various coalition C2 systems that share locations, graphics and reports. «To be able to work together with our joint international partners in the construct of AWA is very powerful», said Colonel Charles Lombardo, commander for 2/1 AD. «In a coalition environment we have to have that interoperable bandwidth; it’s incredibly important. Even though we are an armored brigade, our main weapon system is really our network and being able to distribute mission command down to the edge and to our joint and collation partners is the focus». Each of the coalition countries have their own unique transport networks that enable them to connect into the combined coalition network. 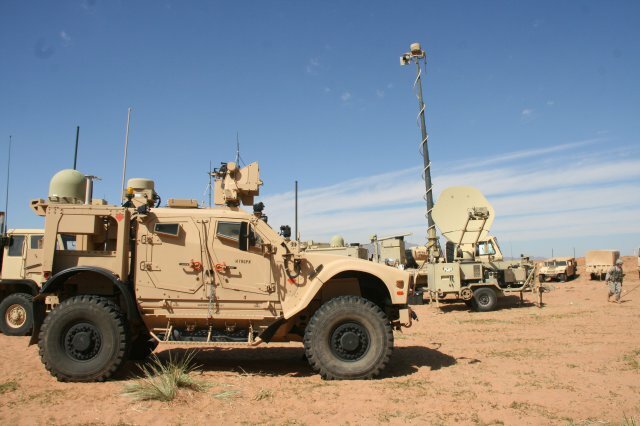 During the exercise, the U.S. Army is using its Commercial Coalition Equipment (CCE) enclave to connect to the coalition network over its mobile tactical communications network known as Warfighter Information Network-Tactical (WIN-T). WIN-T enables mission command, situational awareness and secure reliable voice, video and data communications, both inside a stationary command post or on-the-move in tactical vehicles. «The WIN-T network provides more operational flexibility and agility, which gives back tactical time», Lombardo said. «I am making more educated decisions because I am making decisions with better and more accurate information». Not only does the CCE enable U.S. forces to connect to the coalition network, it also provides a Radio Bridging Voice Cross-banding capability that enables radios on different frequencies, or different equipment such as radios to Voice over Internet Protocol (VoIP) phones, to seamlessly talk to each other, which is essential in coalition operations and also during disaster response where different players and organizations have their own equipment. 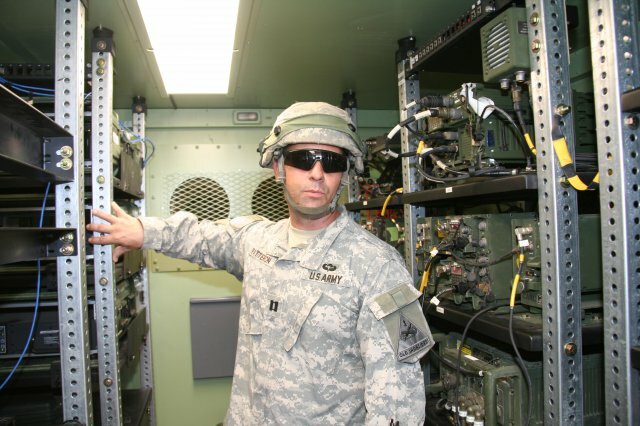 The U.S. Army uses its WIN-T network to enable mission command capabilities such as Command Post Of The Future, which provides the common operating picture and enables real-time collaboration; and the Advanced Field Artillery Targeting and Direction System (AFATADS), used for fires coordination. AWA 17.1 is providing a venue to securely improve the interoperability between American and coalition mission command and communication systems, including the speed and accuracy of coalition fires missions. Improving interoperability and the speed of data sharing is only part of the solution to increasing battle tempo; the U.S. Army is also working to improve maneuverability by reducing the Size, Weight and Power (SWaP) requirements of its systems, including Command Posts (CP). Lombardo said that both U.S. and coalition forces are going through a change in operational tactics, moving away from «the counterinsurgency static forward operating base-mentality of the last 15 years to being able to move out in a matter of minutes». During AWA 17.1, 2/1 AD is assessing a vehicle-based CP concept that results in a smaller physical footprint for increased maneuverability. This design uses several pre-wired expandable vans intended to deliver the network and mission command at workstations inside the van, significantly reducing the space needed in an enormous legacy tent-based CP. The unit is also looking at a unit-designed CP network server van, which combines two Humvees and shelters into a single vehicle, creating a server room and tactical radio platform all in one, without need of unloading equipment into the CP. Additionally, Soldiers on-the-move inside their WIN-T network-equipped vehicles can actually bring the CP with them on the battlefield. They can dial into meetings, conduct mission command and view the coalition common operating picture for uninterrupted situational awareness regardless of location. The unit’s goal is to be able to jump the main brigade CP within hours instead of days, and the smaller forward Tactical CPs within minutes. «We are downsizing ourselves, scaling down network mission command platforms, while increasing mission command capability, to fight on-the-move with continuous effects on the enemy», Lombardo said. «At the end of the day our Soldiers are taking less time setting up tents and the network and focusing more time on their jobs and the enemy». On the battlefield time is pivotal during critical and complex missions, and coalition forces agreed that increasing the pace of battle to provide overmatch requires multiple solutions, including reducing footprint for increased agility and delivering uninterrupted network communications to both internal formations and between partner nations. «Every step of this process we are trying to generate additional tempo», said deputy chief of staff for 1 Armoured Infantry Brigade. «If we can have that shared understanding digitally, we are able to think quicker than our enemy, make decisions quicker than our enemy and outmaneuver and defeat our enemy. That is the whole purpose of this exercise».